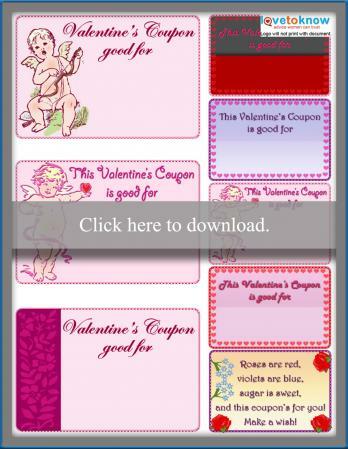 Making your own coupons can be a great gift idea when you want to show your appreciation for someone special while sticking to your household budget. Remember, a gift doesn't have to be expensive to be meaningful! In many cases, a gift of your time will be much more valuable than some trinket purchased at the local mall. 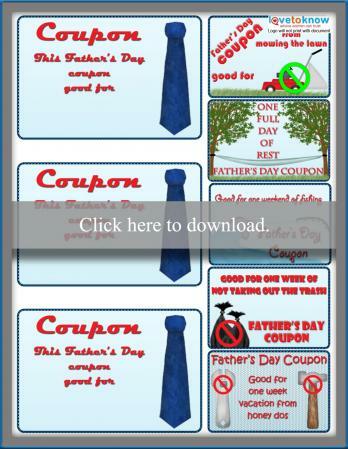 The printable coupons provided here are free for you to download and to use to create your own coupon gifts for various occasions. Just click the image of the style that meets your need and it will open as a PDF document that you can print and even save to use later. If you need help with downloading the coupons, check out these tips. If you're planning to give a selection of coupons rather than a single certificate, consider making a coupon booklet from scratch. Creating a do-it-yourself coupon book is a simple project, even if you're not normally a "crafty" sort of person. If you're a parent with young children, having your kids help with the project is a great way to begin teaching them about the importance of caring for others. Even preschoolers can design their own coupon books with minimal adult supervision. Cut strips of paper to a uniform size. Typically, 10-15 coupons is enough to create a special book. 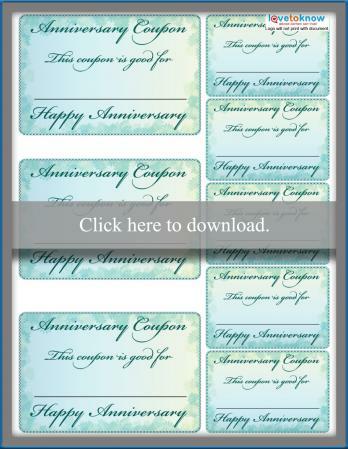 Write out different coupon titles, customized to fit the age and interests of your gift recipient. Don't be afraid to be creative with this part of the project. 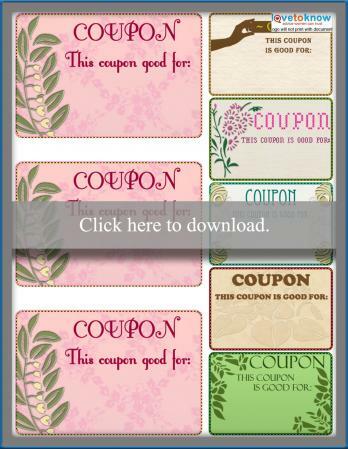 Decorate your individual coupons with stickers or rubber stamps. Use your construction paper or colored card stock to design a pretty cover for your coupon book. Staple your coupon book together. Although it's not strictly necessary, you may want to consider putting an expiration date or other restrictions on the coupons you make, especially when the coupons involve a financial expenditure for you. Offering to purchase your son or daughter a new toy may seem like a good idea, but you don't want your child to try to redeem the coupon when you're broke and anxiously awaiting your next paycheck! 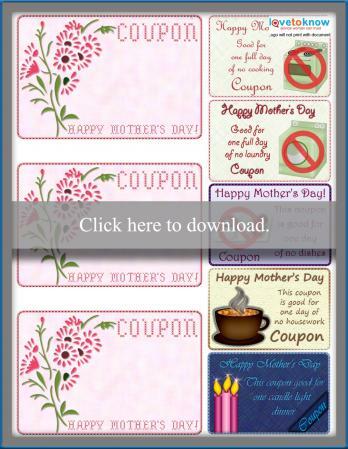 Although it's quite simple to make your own unique coupon books, there are several websites where you can find printable templates too. 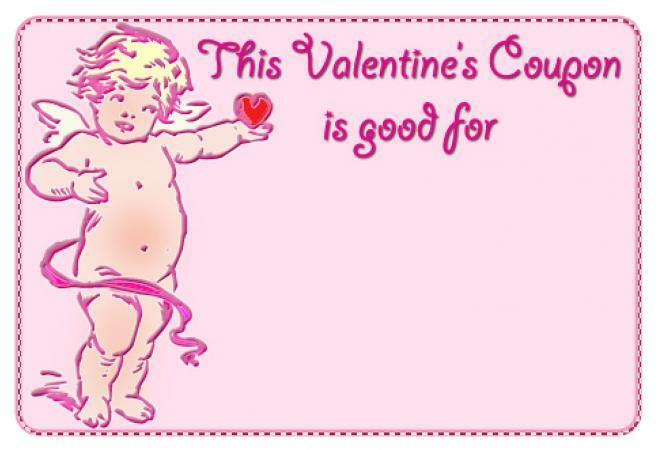 American Greetings has nicely designed printable coupon books to suit a variety of occasions. While the site does charge a small membership fee ($4.99 per month or $19.99 for a full year), you can sign up for a one month free trial. Pastiche Family Portal has printable coupons and gift certificates with a number of different themes. Options are available for a wide variety of occasions, such as Mother's Day, Valentine's Day and St. Patrick's Day. DLTK has an interactive tutorial that lets you create your own customized coupon books with holiday or character themes, as well as designs featuring popular cartoon characters from Blue's Clues and Dragon Tales. All Free Printables has a cute chore coupon book that kids can make for Mom or Dad to promise they will help out around the house more. It is free and makes a great gift for Mother's Day or Father's Day. Personalized coupons are a thoughtful - and frugal! - gift idea that anyone is sure to appreciate. With the resources and ideas provided here, you have plenty of options to create a wide variety of DIY coupons for all of your gift giving needs.